Not too far away now, so get prepared. One thing you can do is ask a leading question of all candidates. Then, possibly, an advert like the one below could be placed in the local paper. Local volunteers will be needed to garner the necessary information. And the process must be accurate. Attributions for or against any race-based stance cannot be published on the basis of hearsay. I.e. 1Law4All does not want to mis-represent any candidate’s position. And candidate means any ‘new faces,’ as well as those standing for re-election. That likely means getting something in ‘writing,’ whether on paper or by e-communication. Volunteers for this important candidate screening task should click here to contact the 1Law4All office. In our local council the candidates don’t have meetings and refuse to have any policy statements so it reduced to just -‘ I’m a good person and been on the council for years-vote for me’. Surprise that few people bother to vote. I’ve never heard this subject of race-braced politics being brought up in Wellington? I’m keen to know if there has been any discussion on this here? Yes good time to start the process but do you have a list of those current councillors who voted politically and for decisions, like a non elected committee to make crucial decisions which impact us all, on a race based issue, so we can check for ourselves. As regarding the advert, that looks great but I notice lately that the term Culturally based decisions are being made to, to try and press a point if view in favour of certain issues that really are race based, just a cover up really. 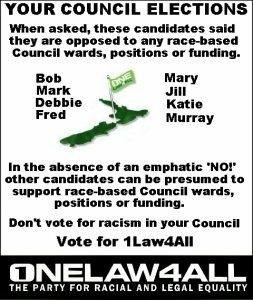 If anyone has information regarding council members who believe strongly in race based decisions, would be good to know to avoid voting for them. We desperately need council officers who vote neutrally for all NZ people, to ensure we are treated all the same. We have to change the raced based running of this city, as well as the country as a whole. It’s totally wrong and totally against democracy. Let’s getting this country United for a change…the world is changing…we need to do the same. A good start, now let all voters get behind the idea and ask all the candidates where they stand on this issue. Make sure that you dont vote for any candidate that supports race based appointments. 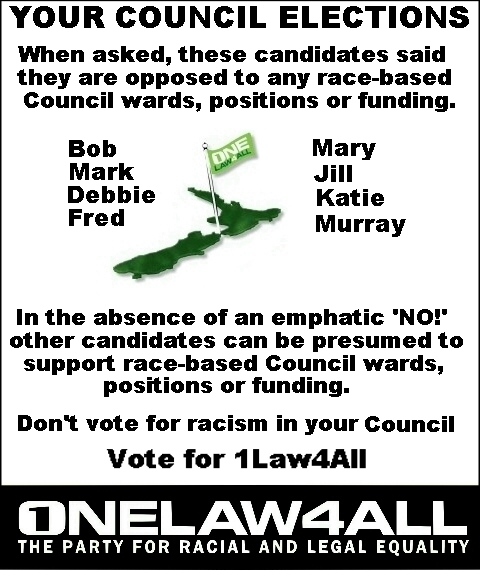 People standing for council should make it known in their candidate profile which goes on the voting papers if they are against race-based policies. also ask the question at a candidate meeting. Yes, I fully intend bringing these questions up. In fact, I’ve been asking Nick Leggart who’s the latest carpetbagger to chase the mayoralty chains about what he stands for so I’ll ask him this question. I shall vote for nobody unless I have a guarantee that that candidate will be vocal in their dismissal of race based undemocratic politics. At this stage, “None Of The Above” is my chosen option. I hope that people will keep us informed on what are told by candidates.